My Home and Garden: Our first vegetables planted in the Back to Eden garden. Our first vegetables planted in the Back to Eden garden. Once I had the paths in place on the east side of the garden, it meant the onions and the potatoes could go in. I got the red onions in. This incredible device was made by my grandfather in the 20's or 30's when he was at his gardening peak. It was given to me by my Dad for Christmas. It is incredible to use. There is more cord on here than I could use in these yards. This row of onions is about 35' long. I raked up the large sticks from the wood chips that went in in the fall. 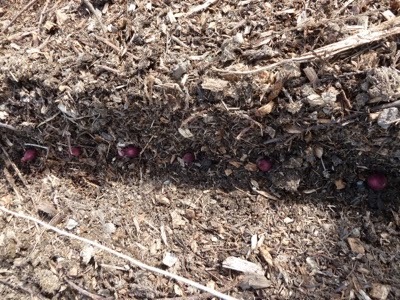 Ran the cord and furrowed down through the wood chip mulch down to soil and placed the onion sets there and covered them over. On the package it said to plant the sets one inch deep. You don't plant the same way in a BTE garden. They need to go down where the soil is. I then watered them in. 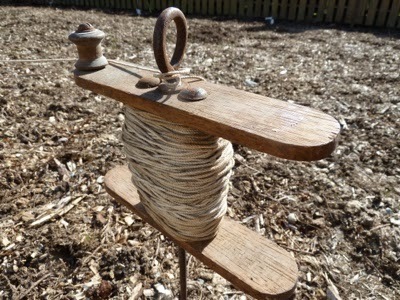 The garden line device is very characteristic of how people used to grow veg one or two generations ago. 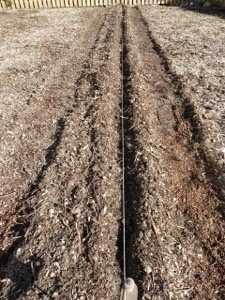 It was always in rows, and rows that were as straight a possible! Gardens were different then. It really was very beautiful wasn't it. Erin that is beautiful and I love the history! We'd love to come check your garden out soon! I would love another tour as well. Dying to see your new greenhouse.